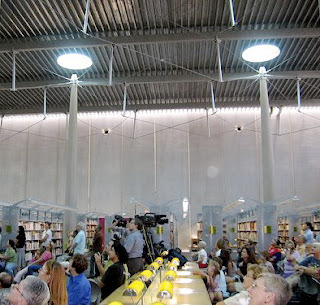 Column tops in the Phoenix, Arizona Burton Barr Central Library by Will Bruder light up at solar noon today and every summer solstice. Bruder, who designed the building to take advantage of Phoenix’ great asset – natural light – spoke about the effect this morning at the library. Library assistant Debbie Veldhuis explains: “There are pillars that start on the first floor and taper off, on the fifth floor, into what we call a birthday candle tip. At solar high noon, or about 12:20 at the library, the end of the pillars start to glow and a light show starts along the side walls. Every day, it does its little show and we all stand there going ‘Wow!’ ” At summer solstice, the sun is at highest, which only make the light show that much more spectacular. So what other buildings are designed to line up with the sun each June 21st? You are currently browsing the archives for the Phoenix Library category.